Windermere Real Estate is teaming up with home remodeling network Porch to make the remodeling and project history of more than 30,000 listings available on windermere.com and across Windermere agent websites. Much like Porch’s partnership with realtor.com, the deal seems designed to generate leads for real estate agents while providing exposure for Porch, in addition to adding value to a real estate search experience. Windermere claims to be the “largest regional real estate company in the Western U.S.” with over 7,000 agents, and Porch says it has data on over 3.2 million professionals and 130 million projects. Screenshot showing a Windermere listing page with the hyperlinks “Renovation Stats” and “Renovation History,” which take visitors to Porch Home Reports. Prospective buyers can view a “Porch Home Report” on porch.com by clicking on hyperlinks — “Renovation History” and “Neighborhood Stats” — displayed on listings that appear on windermere.com and Windermere agent websites operated by Moxi Works, a real estate software provider spun off from Windermere Real Estate. Reports on properties listed by a Windermere real estate agent are “provided” by that agent, with the agent’s photo and contact information appearing prominently at the top of every report alongside Windermere branding. 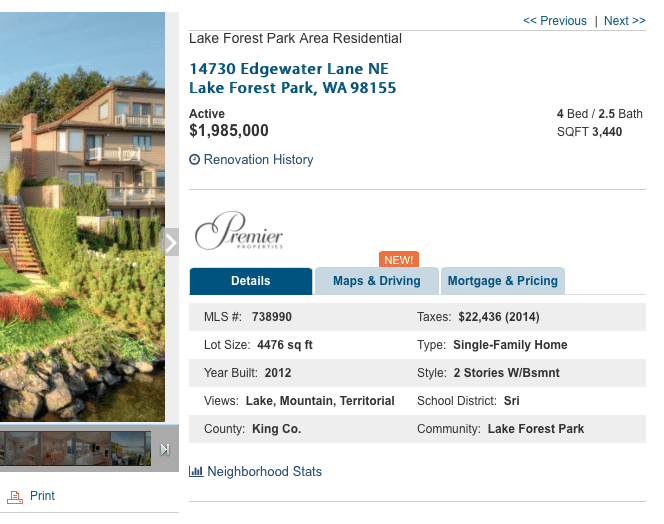 When a property report is generated on a home that’s listed by a competing broker, the report displays Windermere branding. The listing agent’s photo and contact information is not provided. Porch has a similar partnership with realtor.com. Realtor.com users who request a property report are sent one on behalf of a real estate agent advertising on the site. The advertising agent receives the visitor’s email address. Each “Porch Home Report” shows the cost and details of past projects and remodels on a home, background information for professionals who have previously worked on the home and in its neighborhood, and neighborhood statistics, such as how long neighbors have lived in their homes, and the size, age and cost of comparable neighborhood homes. Under its partnership with Porch, Windermere agents who use the company’s customer relationship management system, Moxi Works (software that takes the same name of its provider), will also be able to subscribe contacts to automatically receive home improvement content produced by Porch, saving agents time and keeping them top of mind with people within their sphere of influence, according to Windermere. Editor’s note: This story has been updated to correct that only reports on properties listed by Windermere are “provided” by Windermere agents.